Y'all...it's only Tuesday and I am already dreaming of the weekend. Parks got sick Sunday night which had us off to a rough start to the week. And of course Mondays mean daddy goes back to work too so my Monday to-do list got pushed aside because being a mom is obviously way more important than anything else! So, you could say I am already feeling like it should be Friday and what I could really use is a big bowl of my easy homemade guacamole with a mega sized margarita on the side! Fall has arrived and the weather will be shifting to slightly cooler temperatures soon (fingers crossed anyway) which means entertaining becomes that much more fun because you can host friends outside without melting! My favorite way to entertain has to be cooking up several small bites and serving them with a couple bottles of my favorite wine! It's laid back, casual, and the best way for everyone to mingle and have a great time. 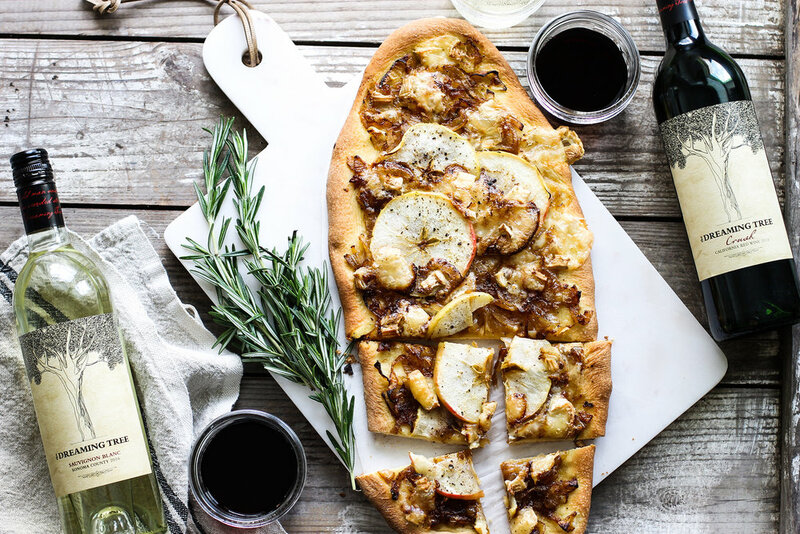 My new favorite wine, The Dreaming Tree Wine brand, pairs perfectly with my rosemary caramelized onion, honeycrisp, and brie flatbread! Hi it's me. Sorry I've been MIA for the past two weeks, but we were on vacation in Boston and Maine and suddenly had to come home because of Hurricane Harvey..and well you know how that went. Life has been interesting to say the least and while our community is still in complete recovery from the storm, I have started to resume somewhat of a normal routine again. My days have been running together and I haven't been sure what day it is for the last week, let alone what season it is! I hear fall is approaching, even though the weather here refuses to let me believe it until this morning where there is, dare I say, a crisp in the air which feels fantastic! With fall, comes all things comforting (which Houston could use right now) and my easy candied pecans are just that...basically a hug in food form. I am beyond excited that last week has come and gone. First of all there are no more sick people in my house, including me, hallelujah. And second, my mom is coming to town on Wednesday! I have an exciting new project that I will be announcing at the beginning of the year which I cant wait to tell you about, but also I have a ton of work to do. So Gram is going to occupy the babe while mommy works works works...and of course we will have some Christmas shopping and wine sipping and all of that in between. Speaking of wine, I will be making these brie and roasted thyme cranberry paninis to be enjoyed in between sips and I think you should make them too. Y'all...the past seven days have been a doozy. I'm telling you, I started out with a horrible cold last week, and then Canean ended up with strep by the end of the week...and then Sunday Parks caught one of our bugs too and has felt bad ever since. I need to set a disinfecting bomb off in our house to make sure there is no germ left standing. Like for real, I cleaned this house from top to bottom, but now I feel like I need to do it all over again. Anyway, I haven't had much time to do much else other than take care of my guys, like spend time in the kitchen, but never fear these easy pork tenderloin sliders with basil aioli are to the rescue!